Proteins – a necessary component of human nutrition. In their natural form they are found in meat, fish, milk, eggs and other protein products. People actively involved in bodybuilding, take protein shakes and mixes to accelerate the growth of muscle mass. For muscle growth you need to take a day 1.5-2 grams of protein per 1 kg of body weight. Be aware that in the protein product typically contains 70-75% protein by weight. That is, consuming 100 grams of protein, you are taking 70 grams of protein. Based on these data, a person weighing 70 kg should consume 105-140 grams of protein per day. To avoid mistakes in the calculations of the daily value for protein delivery, follow the instructions on the product packaging. Do not try to increase your daily protein intake, hoping faster to build muscle. Excess protein is not absorbed and simply excreted. You should also not skimp on the protein and reduce its daily rate. This has a negative impact not only on the rate of growth of muscle mass, but also on the body's ability to recover after significant physical exertion. For proper muscle building protein should be taken daily in the same quantity regardless, you go out today at power training or not. This is because the body constantly needs protein. During rest is the restoration and growth of muscle fibers. These processes are as energy-consuming as a regular exercise routine. Protein powder must be dissolved in water. The amount of liquid does not matter. Do not pour powder boiling water as in hot water, a protein folds and partially loses its properties. Your daily dose of protein product it is better to divide into two or three portions. So the body will more easily digest large amounts of protein. Do not eat protein with any meal. In combination with other nutrients protein is much less digestible. Usually a protein drink between meals. You can take one serving between lunch and Breakfast, and the second is immediately after weight training. The protein intake after exercise is particularly effective, because after a lot of energy to digest protein especially good. On a day when you're not in a sports club, drink protein an hour before dinner. In bodybuilding and fitness is important not only regular exercise but also a proper balanced diet that includes enough vitamins and nutrients. For the normal formation of the different groups of muscles person needs protein or protein, and so many bodybuilders take protein shakes in addition to usual diet to increase the body's amount of muscle building material. If you have decided to start drinking protein shakes, you need to know about some rules of admission of additional protein. It is best to drink the cocktail immediately, but in several stages, dividing the norm of its volume a few doses. Before training, drink one part cocktail after a workout, the second that the body did not lack in proteins throughout the class. 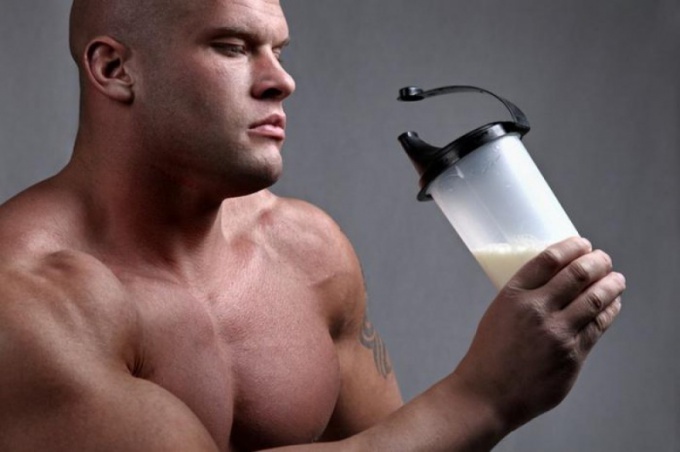 If you want to quickly and effectively gain muscle mass, get a special whey protein and take it before workouts and after them – this protein acts faster than normal cocktails. Useful to drink protein products at night before bedtime – it's not necessary to purchase special cocktails, enough to buy a simple natural yogurt. In the morning also eating the right dose of protein. Calculate in a special calculator his or her daily value of protein and divide the resulting number by five. You will get the amount of protein for a morning reception in grams. Add the desired amount of protein (for example, 20 grams at a daily rate of 100 grams) milk or any other beverage and drink in the morning on an empty stomach. If you are resting and during the day never training hard, drink protein shakes more a couple times a day. Regularly providing the body with adequate amounts of protein, along with constant training will lead to effective recruitment of muscle mass, and you will be able to find a figure of your dreams. Dietary supplements with protein widely used as nutritional Supplement for quick muscle mass, after serious illness, as a means for quick recovery of the body. Amino acids are the building blocks of protein, with the right intake help suppress the destructive action of aldosterone, cortisol and catecholamine. - milk or any other liquid. Before taking any dietary supplements get a recommendation of a physician and nutritionist, and carefully read the instructions for use of the drug from the manufacturer, as the dose of protein in different preparations may vary significantly. To gain muscle mass use 45 grams of protein per day. This dose is efficiently divided into 3 doses. First the protein intake should be 2 hours after Breakfast, the second one 1 hour before workout, the third is 2 hours after a workout. Although some coaches suggest drinking a protein shake immediately after waking, before exercise and immediately after its completion. This method of application need for rapid recruitment of muscle mass. If 45 g of protein is ineffective after three weeks, increase the dose by one third. For a protein smoothie, use a measuring spoon which comes with a dietary Supplement, mix three scoops with 500 ml of any liquid, carefully shake without using a blender. To get the maximum effect, add protein powder to the milk. If you do not plan to model the reliefs of the body and to build muscle, and want to take proteinto recover quickly after suffering severe disease, doses of dietary supplements and methods of reception you recommend your doctor. Do not exceed a dosage of a biologically active protein Supplement. When taking too high of doses can have a serious problem with the kidneys, liver, gall bladder and pancreas. If poisoning protein, or negative nitrogen balance, loss of appetite, may appear nausea and vomiting. In this case, the full discard protein supplements, eliminate from the diet of protein foods. In the presence of nausea, swelling, vomiting, immediately consult a doctor. Protein is the most popular type of sports nutrition. Drink protein shakes every self-respecting athlete. Protein will fit into your sports diet, regardless of goals - weight loss, mass, or work on the terrain. The foreign word "protein" means only "protein" and it is the main building material for muscles. Growth of muscle mass, increase strength and endurance are the main tasks of a bodybuilder, and therefore, athletes need to consume enough protein, or their muscles just will not grow. In ordinary life, people get protein from food - meat, fish, eggs, milk, legumes. But when loads increase the need for protein increases dramatically several times. Besides, to replenish the protein you need as quickly as possible. For those who are not able to eat 5 chicken Breasts at a time, and was invented by a protein in powder form. The protein used in rest days - in this case, his portion is reduced. 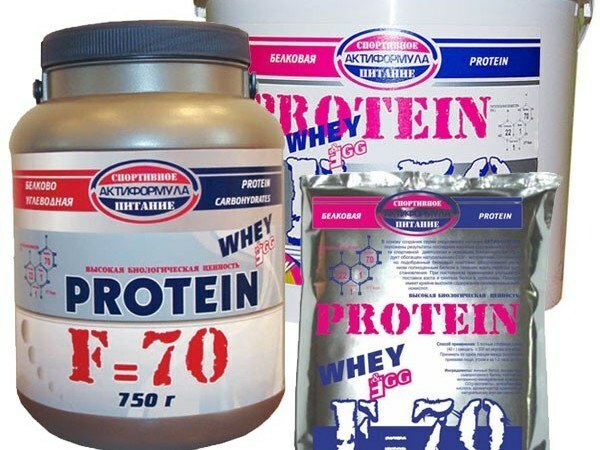 The most popular type of protein is prepared from whey. It is well absorbed and is not so expensive as, for example, egg. Whey concentrate is composed of 60% protein, and isolate up to 80%. Whey protein refers to the high. It is preferable to drink it immediately after workout, within the hour. It will stop the muscle breakdown that starts after a power load, and start the recovery process. 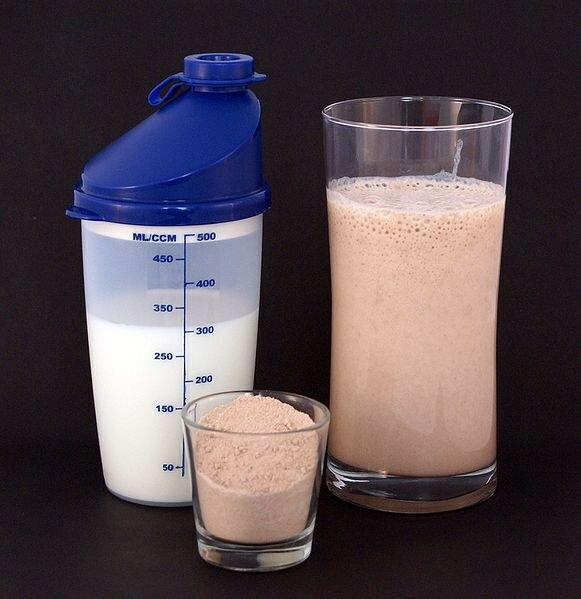 During prolonged exercise, you can drink protein between exercises. Some athletes drink protein shakes an hour before workout. It helps the muscles to work longer and increase their endurance. However, in this situation it is better to replace protein with amino acids. Casein is the protein of milk whey with addition of Storozhevaya enzymes. Casein is absorbed sufficiently long and long time and maintains a feeling of satiety. This type of protein to drink at night to suppress muscle breakdown while you sleep. Natural analogue of casein curd. There are also weight gainers - mix protein with carbohydrates and a small amount of fat. Weight gainers are designed for very rapid weight. But they are suitable not only obese people with very low levels of body fat. Otherwise, a weight gainer can cause fullness. Protein comes in powder form, which is preparing a cocktail. Depending on your weight and workout intensity for a single serving, is taken 1-3 measuring scoop. The powder is mixed with the liquid in the special shaker. Mix protein with any liquid - water, milk, juice, everyone chooses according to their taste. The prepared drink should drink for 3-4 hours. Especially experienced athletes make protein ice cream and even cooking cakes using powder instead of flour.